Product Contents ListProduct OverviewThe Three Silk'n Home Hair Removal DevicesProduct ComponentsBase Unit and ApplicatorBase Unit Control PanelThe ApplicatorIPL vs HPL TechnologyProduct FeaturesSafety TriggerSkin Tone TesterReplaceable Light Cartridge5 Energy LevelsWho Will it Work For? How Does it Work? How Long Does it Take per Session? The Silk'n SensEpil is a home IPL hair removal device. The company labels the technology as HPL (Home Pulsed Light) but the technology is essentially IPL under a different name. ​The Silk'n SensEpil comes with a sizeable base unit into which the applicator sits. The applicator is the handheld device that contains the light that's used to apply the light to the surface of the skin. This device is suitable for larger treatment areas, although the cartridge has a lifespan of 1500 flashes after which you'll need to replace it. The SensEpil is the younger brother of the Original. It is virtually the same device as the original but with additional safety features in order to obtain full FDA clearance for selling directly to consumers. While the original Silk'n product was cleared by the US Food and Drug Administration (FDA), the device could only legally be sold through physicians. Of course, this hampered sales somewhat so the company created the newer SensEpil product. Change to the safety trigger - in the original device, the safety trigger (used to ensure that the product was pressed up against the surface of the skin) was a spring - whereas in the newer SensEpil product this was converted to a skin sensor. The Skin Type Sensor - the SensEpil has a feature that detects the fitzpatrick skin type of the user. This is designed to stop people who have a darkr skin tone than IV on the fitzpatrick scale from using the product. Apart from the additional safety features, the new SensEpil is flatter, smaller and comes in pink. These differences mentioned above aside, both products are exactly the same with regards to energy levels, duration, results and cost. The Silk'n Flash & Go is a newer device than the SensEpil and has been specifically designed and marketed for small treatment areas such as the upper lip, bikini area and underarm. The device is not suitable for larger treatment areas due to its small head size ( < 4cm/sq). Again, the technology in the Silk'n Flash & Go is the same HPL technology that's included in both its predecessor devices. ​Therefore hair removal results are the same as with the other two devices. You can see from the picture that the applicator fits into the base unit flush. The applicator is the handheld part of the device that is place one the surface of the skin to emit the Intense Pulsed Light. The disposable lamp cartridge can be easily removed and is fitted to the applicator​. A skin tone warning light - triggered if the skin to be treated is too dark for safe application. The device doesn't emit pulses in this instance. The image above shows the applicator that is used to apply the flashes to the treatment area. The "laser" is actually Intense Pulsed Light (IPL), however, the Silk'n manufacturer has trademarked the term "Home Pulsed Light" or HPL for short. The manufacturer claims that the new HPL technology is superior than other forms of IPL because it's safer, is effective on a wider range of hair colour, has a larger spot size for faster treatment and is less painful. "The traditional term, IPL, has been put aside for this handheld device, and instead is referred to as HPL (home pulsed light)"
Although not conclusive, this suggests to me that the term "HPL" means exactly the same as "IPL" and is just a clever marketing tactic used by Silk'n in order to promote their technology in a more unique and positive fashion. The SensEpil comes with a safety trigger that prevents the unit from flashing when it's not placed against the skin - useful to prevent accidental flashes from causing damage to vulnerable areas of the body, such as the eyes. A window on the side of the applicator is used to assess the skin tone of the person using the device. If the result is higher than 4 on the fitzpatrick scale, the device won't unlock for use. This is designed to prevent injuries from misuse on darker skin types. ​When the light cartridge runs out of flashes, you can simply purchase a new cartridge from a retailer. The cartridge currently retails at around $40 or $85 for 3. Tip: According to Silk'n, depending on the body areas you wish to treat, you will typically need to use from one to four disposable lamp cartridges during the first year of using Silk'n SensEpil. Useful for building up to correct power setting that's suitable for your skin type. ​ The unit has a maximum power output of 5j/cm2. The device is designed for people who have 4 or less on the fitzpatrick scale. If the skin level is darker, then the unit will not flash. All IPL kits work the same - the Intense Pulsed Light that's emitted from the device targets the melalin cells in your hair (the cells are responsible for giving your hair colour). These pigment cells are heated by the intense light, which in turn damages the follicle of the hair enough to retard future growth. ​The manufacturer, Silk'n recommend that your first 3 - 4 sessions are two weeks apart. The following three sessions should be approximately 4 weeks apart and thereafter you should use the product if and when needed until long-term results are achieved. "I have had noticeable improvement in hair growth, some areas have responded better than others, but everywhere I have treated shows some improvement. My underarms for example now take about 5-6 days before I need to shave, and then it is a small amount of hair compared to shaving every other day with full growth." "It is a well built machine and I have confidence that it will give me good results in the future. 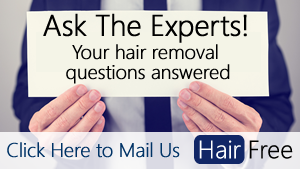 I have noticed slower hair growth as well as lighter in colour hair regrowth." The Silk'n SensEpil has received full FDA safety clearance for selling directly to consumers. In order to assess the safety and efficacy of home based IPL hair removal devices, 22 female patients received six bi-weekly treatments with the Silk'n Original hair removal device (note that the Silk'n original and the Silk'n SensEpil use the same technology and give the same results). As with all home IPL hair removal devices, you will feel a warming sensation on the area of the skin that is currently being treated. Sometimes you'll feel irritation up to an hour after treatment with redness around the hair shaft and slight swelling. Pain is subjective, with tolerances varying greatly - however nearly everyone who uses this product describes the discomfort as tolerable at worst. ​The mild discomfort is not specific to this product, but rather a consequence of the technology being used across the board form home laser hair removal devices. The SensEpil is impressive in a number of ways. Firstly, and arguably the most importantly, the clinical data really shows the effectiveness of the device for the majority of people that use it. Given that you, as a consumer considering purchasing, have a skin tone of less than IV on the FitzPatrick scale then this is very likely to give you decent results as outlined in the clinical data section of this review. ​As well as having strong effectiveness, the data also shows that you are likely to incur only very minor side effects. I like the fact that the device is suitable for use on both large and smaller treatment areas. It's also nice to know that the safety features are there to prevent accidents such as burns or eye damage. My main issue with the device is the limited light cartridge life. They are not particularly expensive at approximately $40 per unit, but it's just an added hassle and expense that some other home hair removal devices don't have. However, when all is said and done, with this device you're getting a clinically proven, FDA approved, home hair removal device for less than $200. In most clinics, that's the equivalent of 1 professional laser hair removal session. To be clear, it's $300 cheaper than its rival, the Tria 4X home laser, and despite the additional expense of the refill cartridges, I think this product is a very strong candidate and gets our seal of approval. Hi. Which is better… the laser of the tria 4x or the best of the ipl machines? I’ve read that laser is more permanent but most reviews talk about them as equals?